Video look like 1.25x, unreal. Holy Sheeee-it! You know, when I get on the iMac with "F1 2017" to play, you can race in "Classic Mode" which brings up this old Ferrari. It's faster than a 2010 RB6 in a straight line but loses ground in corners. That video was amazing, thanks! That V10 is screaming at 19k RPM, seems he was not holding anything back on that lap. Gene was the test driver for Ferrari in 2004, and the F2004 car he drove 10km's in was heavily based on the F2003-GA which he drove to the record at Road Atlanta. Nice to see it on proper slicks and not the grooved tires of that era. Pretty unreal to see a F1 car at Road Atlanta and lack of track side fencing and protection. Last edited by Legend2TL; 09-11-2018 at 12:21 PM. Wow. I always thought Road Atlanta was quite big. But after seeing that video, it looks like an amateur track or Lime Rock. 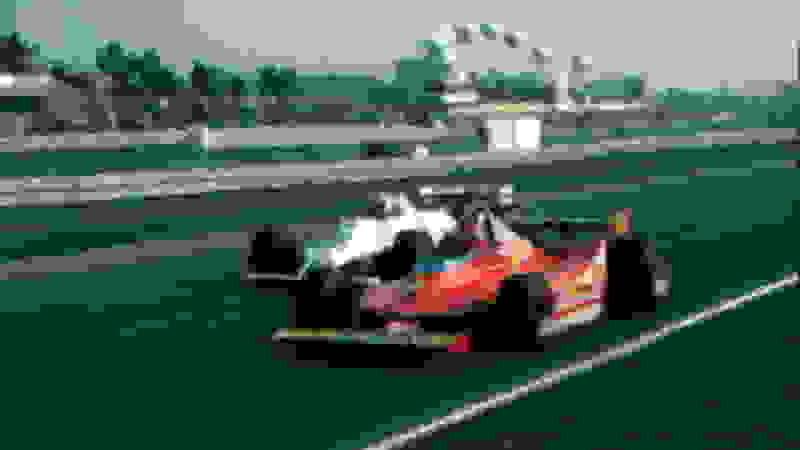 I'd be curious to see how quick the F2003 can go on Lime Rock. That was my other thought, I wasn't actively following F1 in those days, but watching it I thought it odd that it was on slicks. Random question: What was the logic or thinking for running grooved tyres back in the day (c. 1998-2008)? Thx. I’m now gonna ask the perpetual 2-yr old’s question: But WHY? And then why back to slicks in 2009? ^ By having four solid tread blocks with three grooves separating them allowed the tread sections to squirm around more than one continuous tread block (like a slick tire) in cornering where lateral forces cause the rubber to deform. 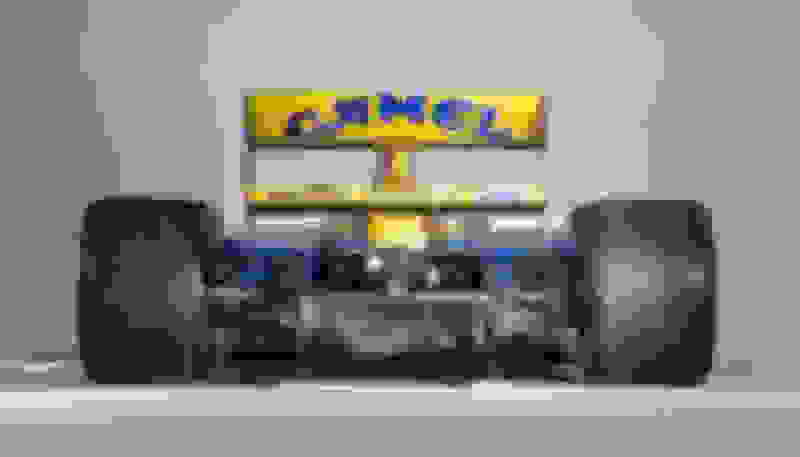 The why is F1 felt the cornering speeds were too high in the 90's especially after Senna's death. Took a few years but reduced engine size from 3.5l to 3.0l, narrowing the car to 1.8m reducing downforce, and having grooved tires would slow down the cars. It did for awhile but as that video above shows, the speeds eventually caught back up. FIA reducing the engines again from V10 3.0l to V8 2.4l. I don't remember why slicks came back, my guess is since there was only one manufacturer then FIA could control the grip levels with "control" aspects. My guess is the silly concept was overcome by single tire supplier and the tires just looked odd. Last week Michelin made a statement that they have no intention of returning to F1 if it meant 13" tires and being told to engineer in tire wear characteristics like Pirelli does now. IMO, the current Pirelli tires are making F1 competition worst by having ridiculous tire strategy, example by Bottas backing up Kimi at Monza causing the rear's to go significantly off. 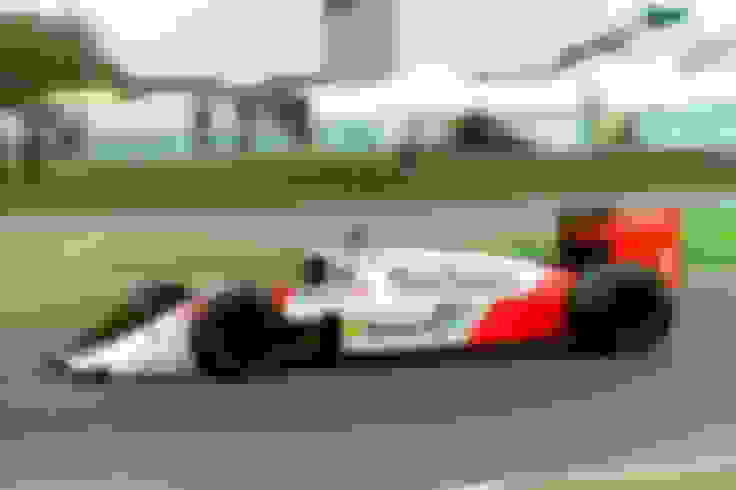 Twenty-five years ago this week, Alain Prost won his fourth world championship – and promptly retired. The car in which he achieved this final success, and which took Damon Hill to his first Grand Prix victories in the same year, was the technologically remarkable Williams-Renault FW15C. This was the ultimate electronic aids car before most of the technology was banned for 1994. It featured active ride, traction control, ABS braking, a set-up that could be adjusted between corners and the ability – at the switch of a cockpit button – to stall the rear diffuser for reduced drag down the straights. The driver could also choose between manual and automatic gearshifts. 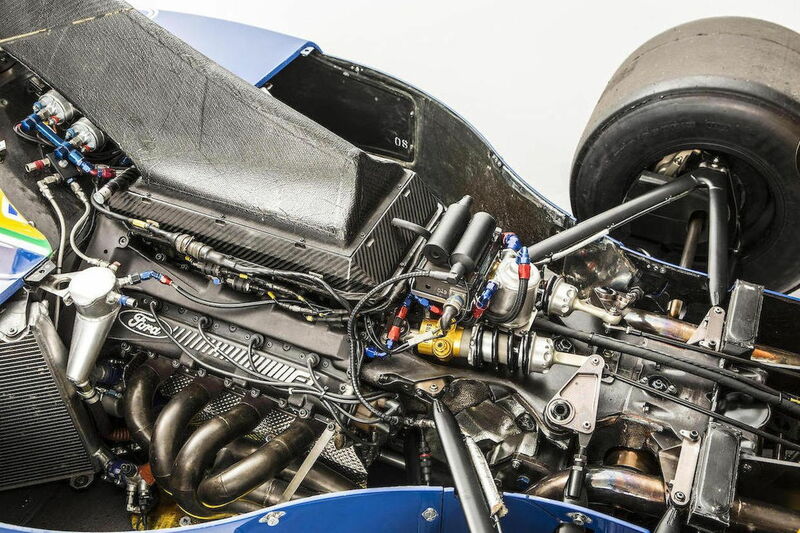 In terms of the electronic ‘goodies’, the FW15C can be considered the most advanced F1 car of all time, even though knowledge has advanced enormously since 1993. The FW15C was an evolution of the FW14B that had taken Nigel Mansell to the 1992 world championship. 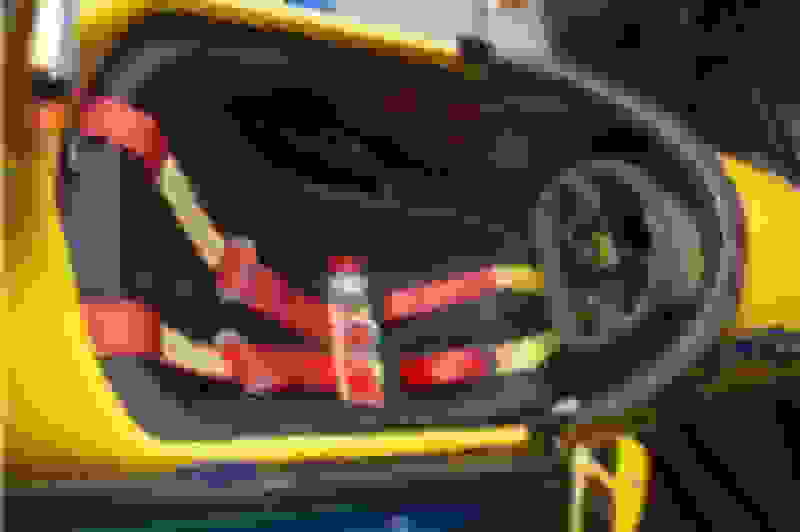 The 14B had been an active ride adaptation of an existing car, but the 15 was designed at the outset around the new technology, under the technical directorship of Patrick Head and Adrian Newey. Paddy Lowe, recently returned to Williams as Chief Technical Officer, was the systems engineer who wrote and developed most of the software necessary to make the active ride system work. The use of hydraulic pressure to lengthen or shorten actuators fitted to each wheel (as determined by the computer reacting to the measured loads upon the car) allowed the platform of the car to be maintained in the most aerodynamically efficient position at all times. It was therefore immune to the otherwise inevitable aerodynamic compromise resulting when a conventional car pitches, dives or rolls on its suspension. This capability was worth whole seconds of lap time over conventionally-suspended cars and Williams were the first to fully exploit the technology, in partnership with AP. 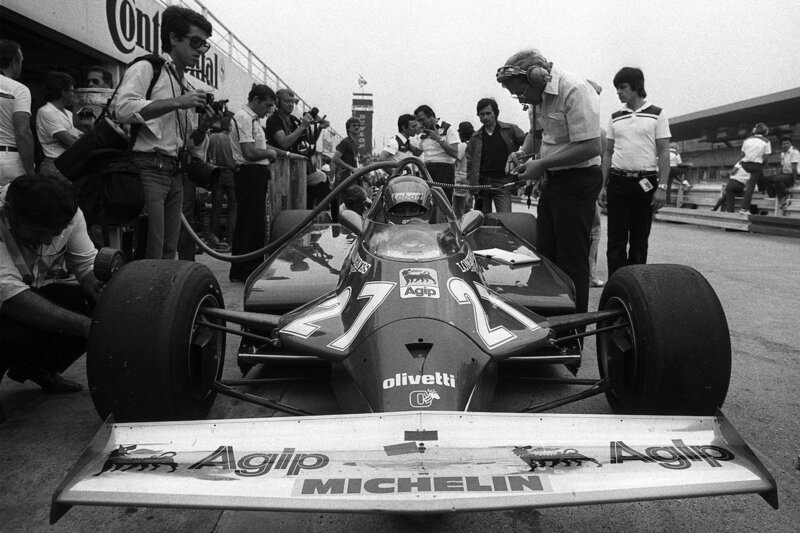 Electronic digital control was the breakthrough that allowed the full potential of active ride – which had been tried on and off in F1 since 1983 – to be realised. This, in combination with Moog proportional servo control valves, finally gave the system the necessary response fidelity and reaction time. Because the car could be kept in a much narrower range of ride heights and rake angles than a conventionally-sprung car, the aerodynamic surfaces could be made much more ‘peaky’ as the downforce was no longer required to be consistent over anything like as wide a range of attitudes. It allowed the front wing and diffuser in particular to be fashioned much more aggressively. 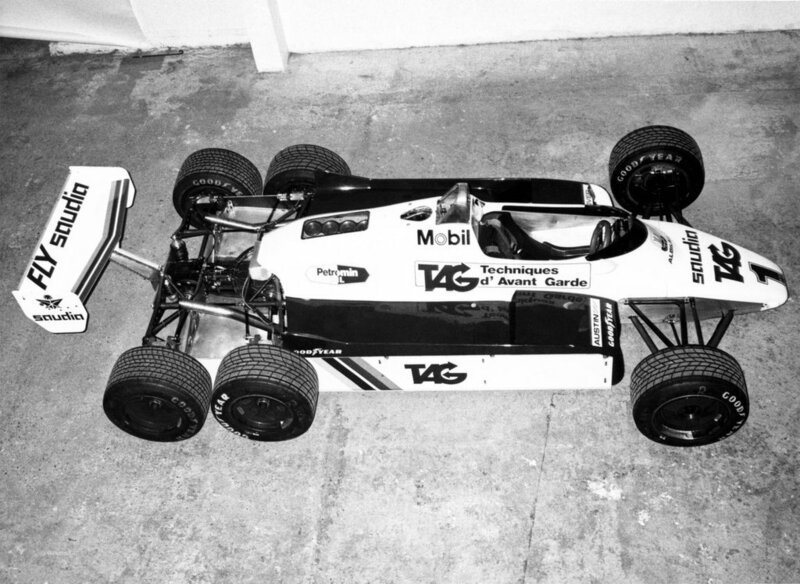 The FW15C was reported to have a lift:drag ratio improvement of 12% over the 14B – this despite a late-notice regulation change for ’93 that reduced the track of F1 cars to 1.8 metres (from 2.0) and which stipulated a minimum height above the ground for the front wing endplates. 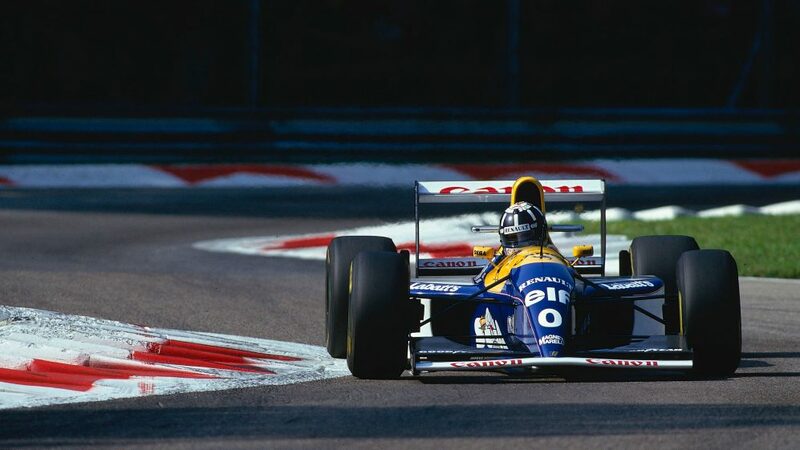 These changes, together with narrower rear tyres, might have been expected to have made the FW15C slower than its predecessor, but in fact it was significantly faster on almost every track. 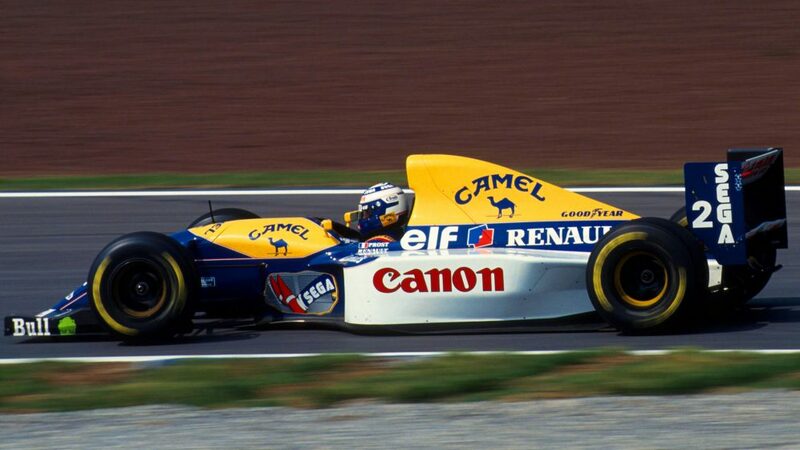 Both cars featured exhaust-blown diffusers, but the more aggressive design of the ’93 car, together with development work on the engine mapping from Renault Sport, significantly increased the effectiveness of this feature. In addition, with the RS5 engine, Renault had given its 67-degree 3.5-litre V10 new con rods and revised the inlet and combustion chambers to give an extra 30bhp over the ’92 motor (taking it up to 780bhp). 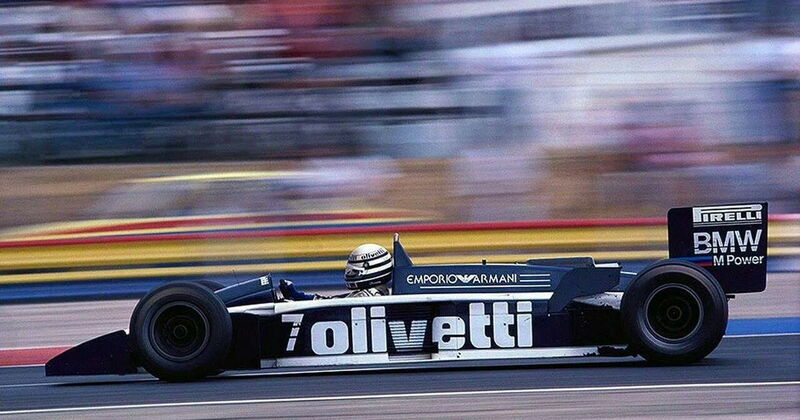 Bernard Dudot’s masterpiece, it remained F1’s best engine by far – more powerful than the Ford V8s in the McLarens and Benettons, lighter and less thirsty than the Ferrari V12s. Other improvements over the FW14B included the addition of power steering, as the downforce levels being reached were beginning to make it difficult for smaller drivers to extract the maximum from the cars. Given that for ’93, Williams had replaced Nigel Mansell with Prost, this was an important feature. There was also electrically-powered braking assistance – also to help the drivers exploit the increased braking potential arising from the downforce increase. The driver could choose to use the paddles behind the steering to change gear semi-automatically, or to leave it in auto mode when it would change up and down automatically at the appropriate time. As soon as the driver touched the paddles, it would revert to manual mode. 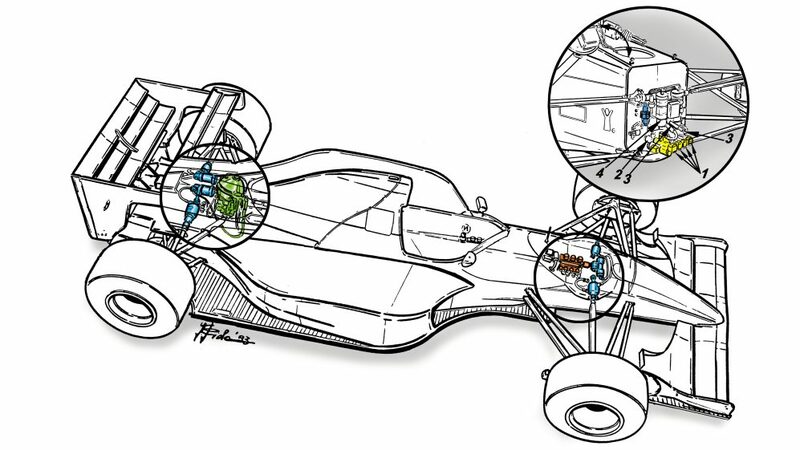 In the FW14B, the driver could also choose the car’s angle of attack by adjusting the front ride height via a knob. The ideal rake angle will vary according to the speed of the corner – and this allowed the driver to have his cake and eat it. But in the 15C, this feature was automated into the software – so the car would continually be changing its own set-up! Another neat feature was a button that would lower the rear of the car and thereby stall the diffuser, which reduced the drag of the car considerably. This was incorporated via the software to give the engine an extra 300rpm when used. It was effectively a ‘push-to-pass’ button. Anti-lock braking was introduced from the French Grand Prix onwards. For ’94, the governing body banned active ride and most of the associated ‘automatic’ electronic technology – and a new, different era of F1 began. So the FW15C stands as the ultimate showcase for where F1 would have been headed but for the interruption of regulation to contain the speed and give more control back to the driver. What an iconic car. One of the most beautiful and innovative car ever made. 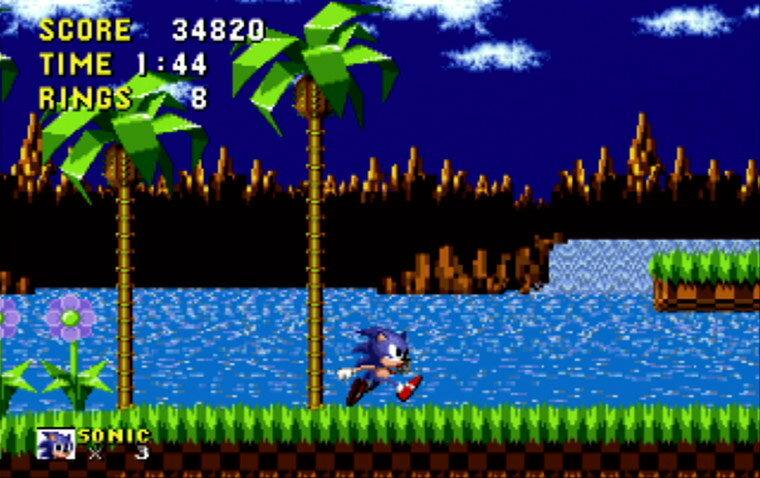 Yes, the Sonic legs on the side were so creative. ...lots of talk about them going to 18's for the new regs as we've seen them test. 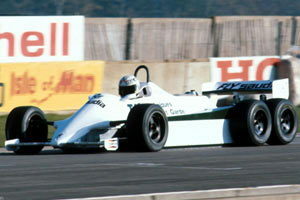 The FW08B was a six-wheeled (4 driven wheels at the rear and 2 undriven wheels at the front) variant that originated from the FW07D (also six-wheeled). It never raced. Patrick Head specifically said that the reason it was banned was because "someone in a FOCA meeting said it would drive up costs and cause chaos during pitstops". The FIA promptly limited the number of wheels for all cars to four, of which only 2 may be driven. “We were all intrigued to see if we could balance a car that had such a large contact patch at the rear and we quickly discovered that we could. I remember Jonathan Palmer telling me that he couldn’t really tell that there were four wheels at the back, although the traction out of slow corners was phenomenal. “The FW08B had no handling problems as such – it didn’t understeer like a pig, as many people expected – but there was so much hardware on the car that it was bloody heavy. It was going to be a huge challenge to get it down to a reasonable weight. © Williams Grand Prix Engineering Ltd.
Too bad it never raced. It does make the car look like a semi truck though. Loved the video. I like how Gordon Murray kept saying that the MP4/4 is an evolution of the ideas he brought from Brabham. In the year 2018, that would be called intellectual property theft! It's hard since both designers had previously designed low cars so I can see both of their viewpoints, Nichols 1987 MP4/3 was similar as was Murray's 1986 BT55. Last edited by Legend2TL; 10-24-2018 at 08:36 AM. 1992 Benetton Ford chassis B191B-06. Photos courtesy Bonhams Auctions. 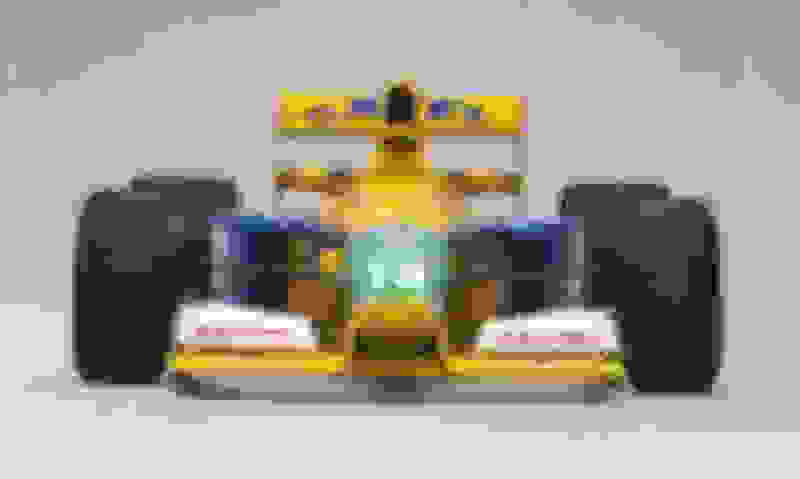 In 1991, Michael Schumacher was at the very start of a Formula 1 career that would later see him capture seven championship titles. 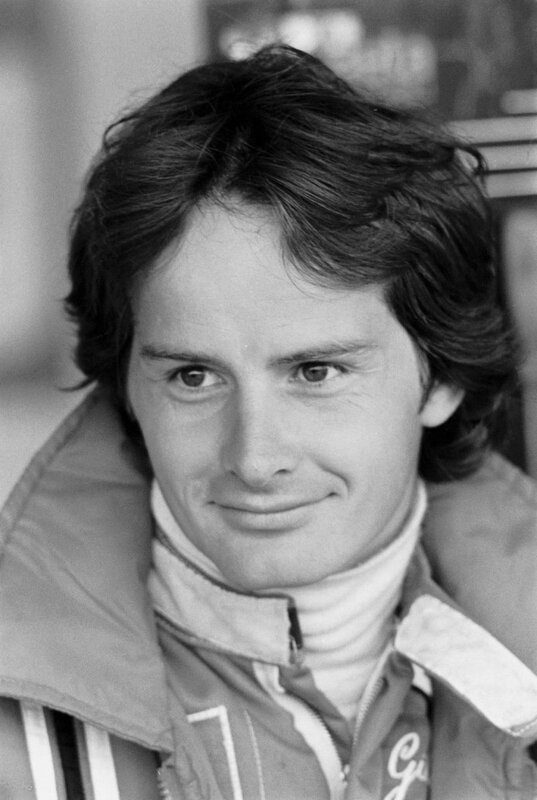 After making his F1 debut with the Jordan team, Schumacher joined Benetton, where he raced alongside accomplished F1 driver Nelson Piquet (and in ’92, Martin Brundle). Last weekend, a 1991-’92 Benetton Ford, raced by Piquet, Brundle and Schumacher, to his very first F1 podium finish at the 1992 Mexican Grand Prix, sold for a fee-inclusive 1,058,000 euros ($1.2 million) at a Bonhams auction in Monaco, easily breaking into the sale’s top-10. Chassis B191B-06 debuted with the Benetton team at the 1991 Hungarian Grand Prix, where driver Piquet’s day ended early with a gearbox failure. Subsequent races saw Piquet drive chassis 06 to a fifth-place finish in Portugal, an 11th-place finish in Spain and a seventh-place finish in Japan. The 1991 season’s final race was Australia, and there Piquet finished fourth in chassis 06, in a rain-shortened race that also marked the end of his F1 driving career. John Barnard’s chassis design carried over into the start of the 1992 season with only minor changes, still powered by a 3.5-liter Ford V-8, updated to Series VI form with pneumatically operated valves. New Benetton team driver Brundle was the first to drive the car during the 1992 season, qualifying eighth on the grid but retiring with clutch failure on lap two. For the season’s next race in Mexico, chassis 06 was assigned to Schumacher, who qualified the car third on the grid and delivered a third-place finish, his first podium in F1. 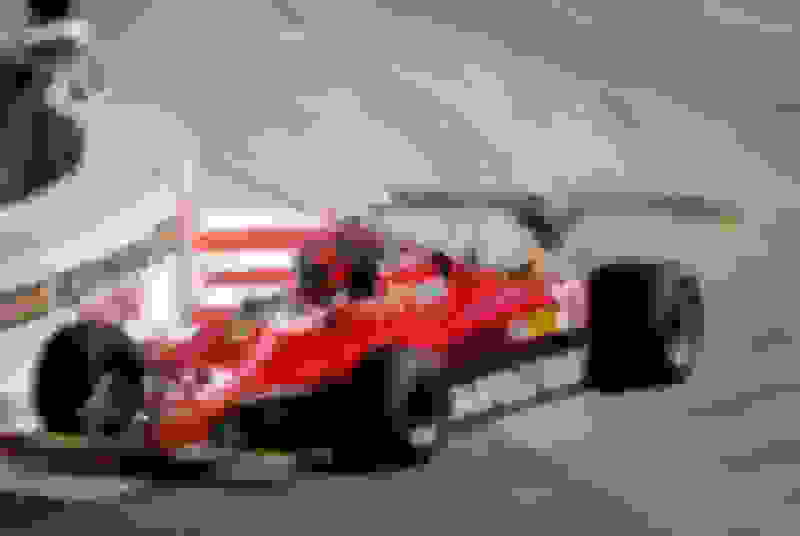 Schumacher raced the car again in the 1992 Brazilian Grand Prix, qualifying fifth and capturing his second third-place finish in a row. Following this race, chassis 06 was retired by the team and replaced by the B192 chassis, which would later carry Schumacher to his first win at the 1992 Belgian Grand Prix. 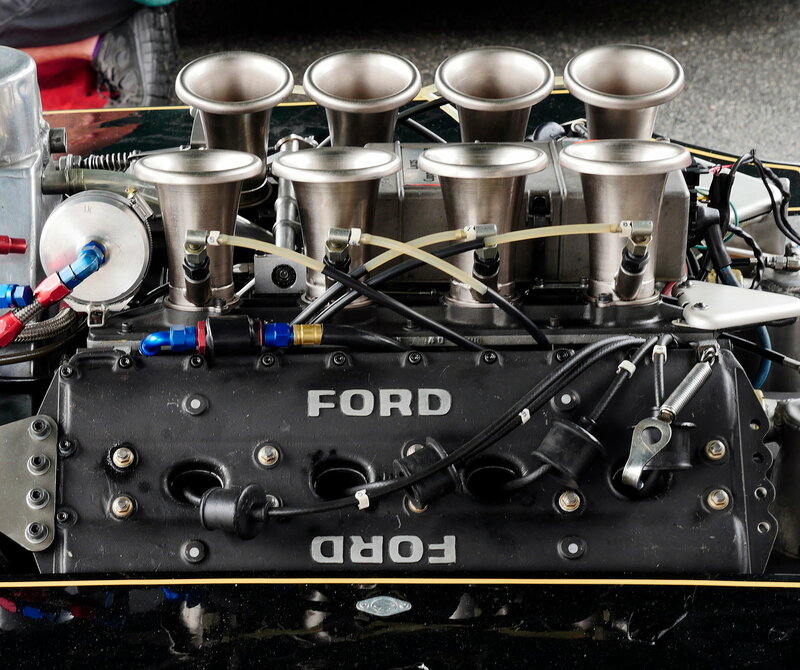 As offered for sale, chassis 06 was described as in running order and “impeccably well-presented,” powered by a 72-degree Ford HB V-8 that revs to 13,800 RPM and sends an estimated 730 horsepower to the car’s six-speed-manual gearbox. Ideal for vintage racing, it’s also a piece of Formula 1 history that would likely be the centerpiece of any museum or private collection. By the way, Gilberto Benetton died earlier this week. ^ The Benneton is B191 is like other John Barnard designs with graceful flowing lines and all the shapes look proportioned and well thought out. 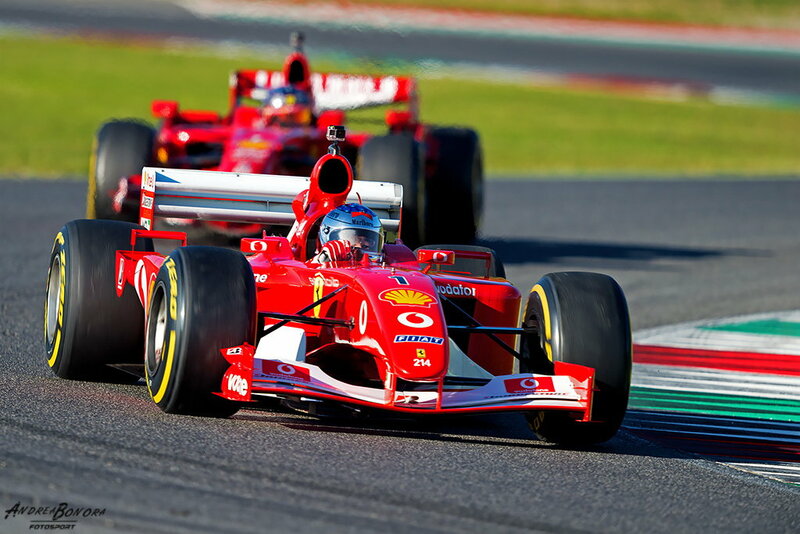 Ferrari’s annual Finali Mondiali (world finals) event took place at a rainy Monza last weekend. Giancarlo Fisichella, Marc Gene, Andrea Bertolini and Davide Rigon did demonstration runs in the team’s 2009 F1 cars. CEO Louis Camilleri and F1 team principal Maurizio Arrivabene were present to hand out the prizes to winners of Ferrari’s GT championships. The Corse Clienti drivers also had the chance to lap Monza in their collection of classic F1 Ferraris, including examples from the eighties and ninties. Yea!! That was sick, my Twitter blew up with pics and stuff from that. Is anyone on here on Twitter? And YES! I love that account, I retweet them at least 2 times a week. Shoot me a DM when you get it going so we can follow each other. I'm at my max but I'll unfollow someone and follow you. 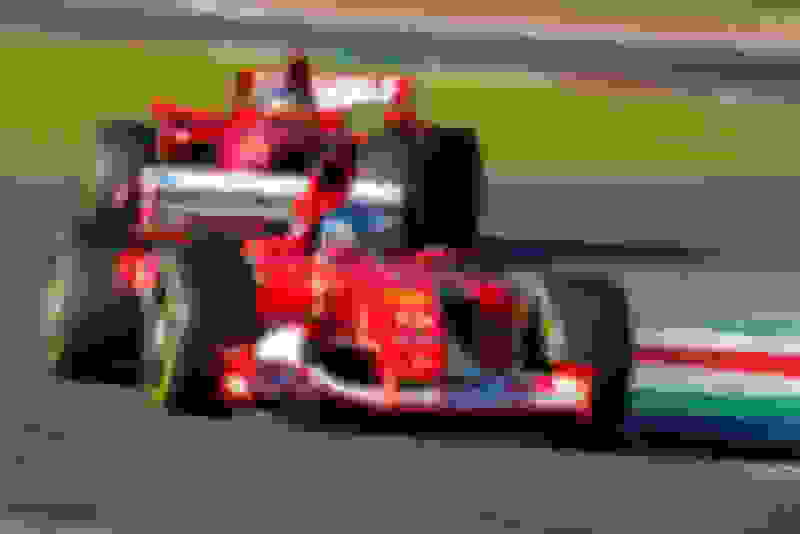 If you’re like me and spend too much of your free time delving into the historical annals of Formula One races, you’ve probably realized how tough they can be to watch. Sometimes ambient race car noises and good battles are all you need—but how are you supposed to know who’s down a lap, which passes are for position? Matt Amys on YouTube has had those same thoughts. 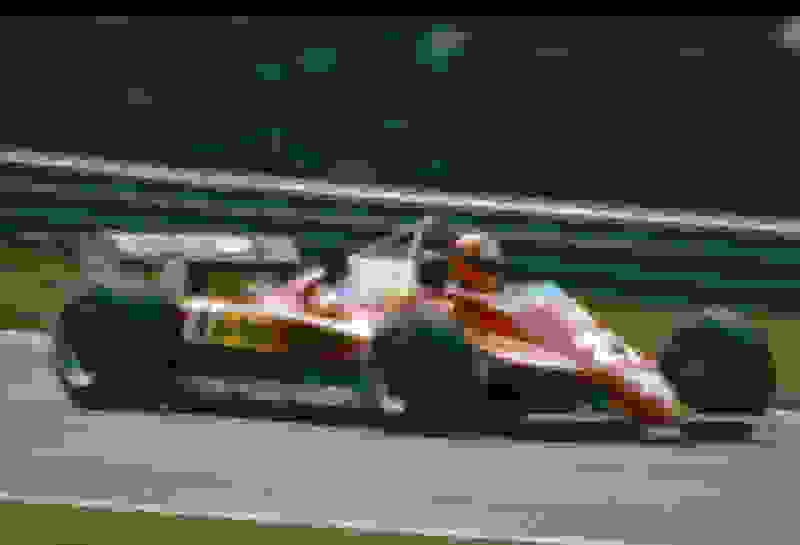 The only difference is, he has the skills to impose modern F1 graphics on some of the most iconic moments of the sport’s history to show us how different the watching experience can be. It’s an incredibly smooth and well-done video. The graphics feel so seamless that you almost don’t notice them—which is pretty damn neat. A few folks—myself included—have noticed how confusing the three-letter driver tags are! I admit that 80s and 90s F1 is not my specialty (I am here for everything pre-1979), but I had one heck of a time trying to figure out who was who on the sidebar. You gotta wonder if new race fans today feel the same way looking at the current driver tags—or if we’re just so entrenched in the sport and hear all the drivers’ names so much that it’s easier to figure out who VAN is after a handful of races as opposed to a thirty second clip. Either way, it’s pretty damn neat. 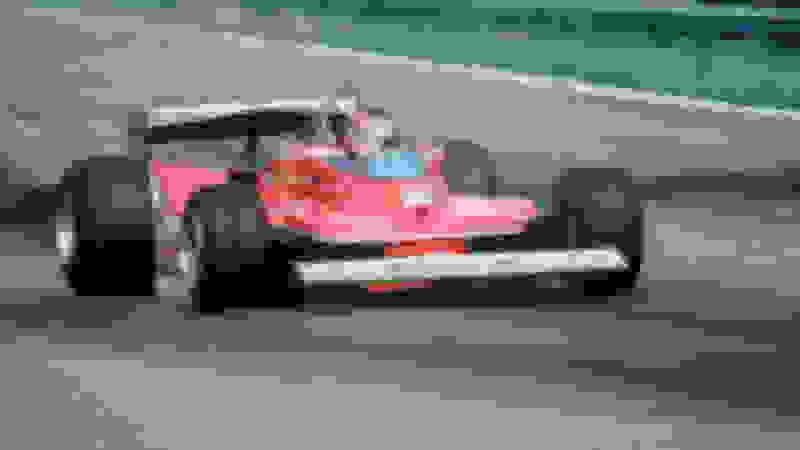 F1 should hire this man to do this for all their old footage—I know I’d be down to watch. I do wish there was a viable way to re-watch some of the old races. I found some Russian(?) site (Dailymotion I think (Sukhoi channel)) that had quite a few from the 80s-90s, but some aren't in English & of questionable quality. I'd love to watch those old races. Is there a way to make those pre-HD recordings into acceptable viewing quality? Those 90's races look awful on tv now. Sukhoi's channel isn't bad, but I was watching on a 14" laptop, not on a 65" 4K TV. Just wish there was a comprehensive archive of older races, in English. In 2016 I went to Laguna Seca for the Rolex Monterey Motorsports Reunion. Laguna Seca is the only race track I have seen in person (I was there once before for a MotoGP race at Laguna Seca). It is a great track for walking around to see the races from many vantage points, including the famous Corkscrew. There is an incredible variety of classic race cars at the Motorsports Reunion from the early 1900s to the 1990s. I really enjoyed the unlimited and close up access to the paddock areas. Here is a photo I took of the Ford Cosworth engine in a John Player Special F1 car. There were two of these cars in the 8B F1 class that year, a 1977 Lotus 77 and a 1978 Lotus 78. I didn't make a note as to which of those cars this engine was in. I really hope I can get back to Laguna Seca again for the Motorsports Reunion. Seeing and hearing these classic race cars in action is an experience which every motorsport enthusiast should all have at least once in his/her life. I have every F1 race on tape from 85-96. Now all I need is a VCR that works . . . .
Yeah, better digitize them before the tape disintegrates. I think I'm missing one race in that time span (Japan?) You guys are right, I should digitize them. I have the horrific Imola weekend where Ratzenberger and Senna both died; Prost/Senna clashes; Mansell/Piquet battles; Schu/Hill, Schu/Hakkinen, Schu/JV battles.